What do you do when the cuisine you want to cook does not even exist? For chefs David Lee and Ace Tan, the solution was to create it themselves. "We were trained in European kitchens, but wanted to do something closer to who we are. It's not that there aren't good restaurants in Singapore, but there was none that we wanted to work at anymore. So many restaurants have Asian chefs cooking Western or Western-influenced food, but Asia has so many more ingredients to highlight, we don't need truffles," says chef Tan. So they decided to launch their own establishment - Asian fine-dining Restaurant Ards, which will open in Duxton on Sept 15. It is a big risk, they acknowledge. Not only are they creating a cuisine from scratch, they are taking the fine-dining route despite a soft economic climate where wallet-friendly restaurants dominate. "Fine-dining is our dream," says chef Lee, who met his business partner when they both worked at modern European restaurant Pollen at Gardens by the Bay. "We want to showcase Asian cuisine as something valuable, worthy of competing with cuisines from around the world. We want to prove Asia is more than just street food." 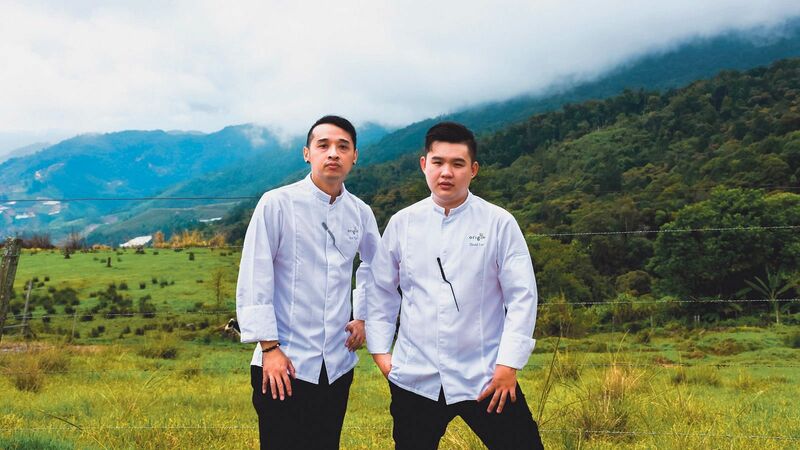 Chef-owners of Restaurant Ards Ace Tan (left) and David Lee. The name Ards is their take on the "arts", and stands for Asia, Roots, Distinct, Singular. 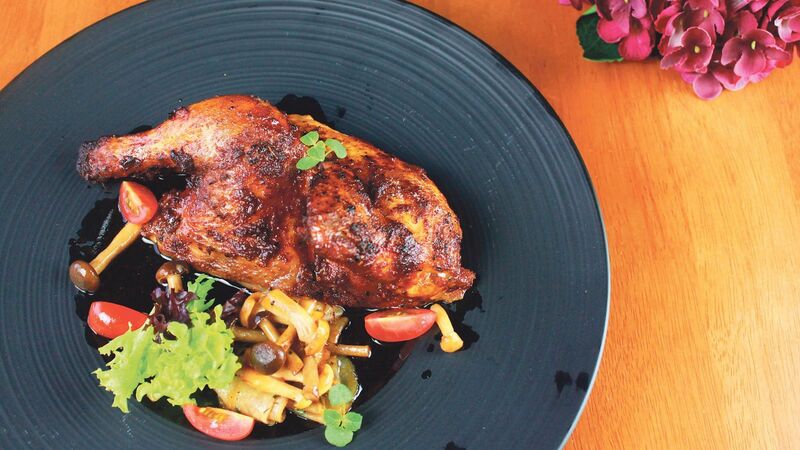 They explore ingredients and cooking methods from the region and create Asian-style dishes such as Mum's Chicken Soup - made by extracting the jus from corn-fed chicken from Malaysia, stuffed with Chinese herbs. It is served with wintermelon infused with chicken jus, braised fish maw, chicken floss and garnished with coriander and Thai sweet basil. 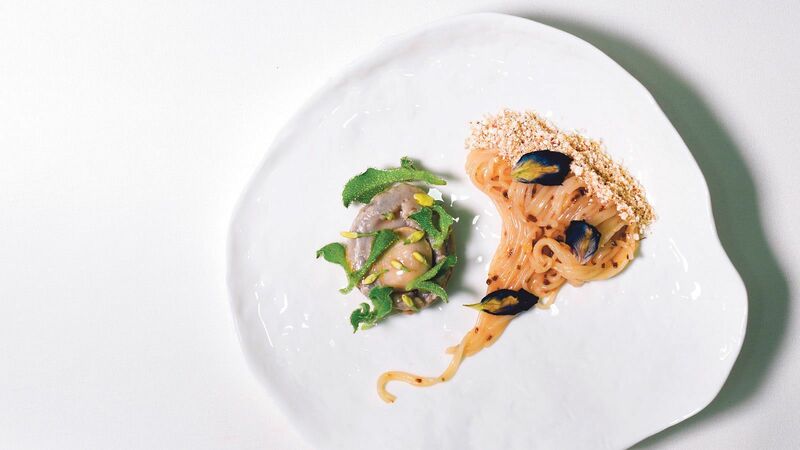 Other dishes include The Seas Of Asia - a Pearl grouper cooked in bamboo leaves with scallop butter, braised sea cucumber and a dry-aged oyster broth, as well as Ear Of The Sea - an 18-hour slow-cooked abalone with house-made noodles marinated in cured kombu, fresh yuzu and a mushroom granola. Ear Of The Sea - an 18-hour slow-cooked abalone with house-made noodles marinated in cured kombu, fresh yuzu and a mushroom granola. It all comes together in a signature 15-course tasting menu titled Piquant Illustration, which is priced at $188++ a person. Set lunches begin at $48++ for three courses and streamlined dinner menus begin at $88++ a person for three courses. While they are still sourcing for Asian wines for their wine-pairing menu, a point of pride for them is the non-alcoholic pairing menu that features various teas from Taiwan and Japan, as well as fresh juices. For now, the food they serve still very much reflects the training from their European backgrounds, says chef Tan. But in time, he believes this will change as they evolve as chefs. "A few years down the road, our restaurant menu will look very different from what it is now. It will be more distinct, without previous experiences influencing us. And by then it'll be totally different and unique from whatever is out there in the market." Yuzu roasted chicken from Coalesce. After four years studying Traditional Chinese Medicine at Nanyang Technological University (NTU), Mr Toh Kok Jin is now a licensed practitioner. His plans to enter the Chinese medicine industry were derailed before they even began, however, when he teamed up with a few friends to open a cafe named Pitchstop in NTU about five years ago. "I always had an interest in food, but when we started, it was more an adventure than a career. Part of the reason was that we wanted to offer a cafe experience that we felt NTU was lacking," explains Mr Toh. Although the cafe closed some time last year, after the building it was in was selected for repurposing, he found himself already bitten by the food-and-beverage bug and was the only one among his friends who chose to continue down this path. About four weeks ago, he opened yet another cafe - Coalesce, at the NTU alumni house in Buona Vista - where he is managing director. The food is "Singapore-centric", where individual elements are authentic to the cuisines they come from, but are creatively combined together. So for instance, the seared barramundi with asparagus, curry foam and turmeric pilaf rice ($22) combines Indian flavours with a fish from Australia, plus asparagus cooked French-style. Another example is the Chai tiramisu (S$5.80), which is a "Chai latte" version of the Italian dessert. 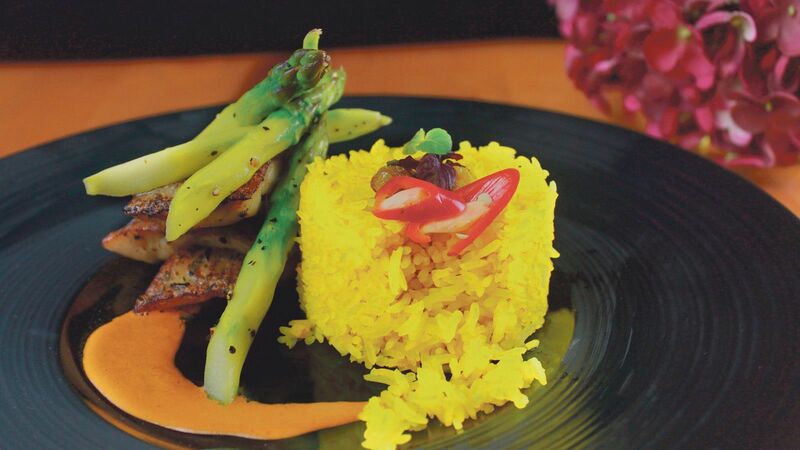 Pan-seared barramundi with asparagus and turmeric pilaf rice. "When we were discussing our concept, we realised that Singapore's cuisine is a fusion of cultures. Hainanese chicken rice isn't from Hainan, for example. So as we progress, our cuisine will be something based on our roots, but with influences from all over the world," says Mr Toh, who runs the business with three partners. "Our aim is to be creative, with Singapore as a central theme. We hope to create the next chilli crab, or Hainanese chicken rice, which will be the next generation's icon of Singapore food. It sounds ambitious, but that's the goal we're working towards." 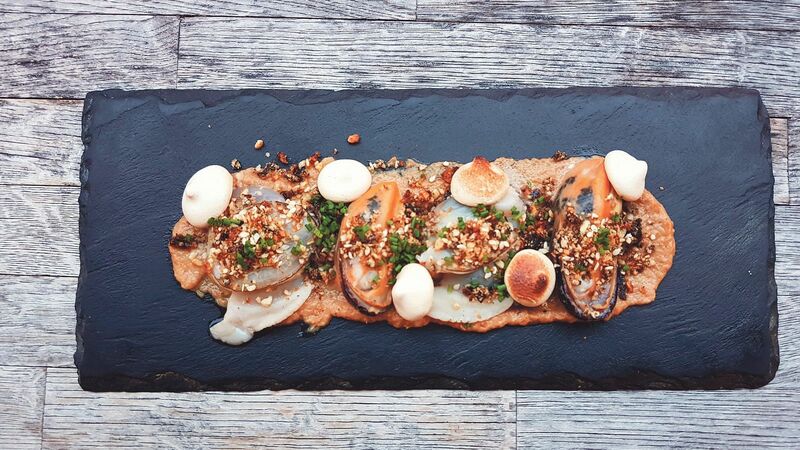 Mussels and XL Clams with charred onion, kelp crumb and meringue. Who says Singapore does not have its own fresh seafood? The guys at Ah Hua Kelong would beg to differ, especially since they built their entire business based on the seafood farmed and caught from their kelong near Changi. It all started with home deliveries, then supplying a few local restaurants, before they took on an outlet at Pasarbella and opened a hawker stall in Simpang Bedok. Most recently, they have launched yet another platform to showcase their wares - a proper restaurant named Scaled by Ah Hua Kelong, which operates out of the kitchen of a bar named Bar Stories in Haji lane. Ah Hua Kelong's Mr Wong Jing Kai says: "Bar Stories had an empty kitchen for about a year after its chef moved on. So we asked the owner if we could have the space and try cooking out of it. At the time, we were considering a location at DUO, which is just across the road, but I didn't want to jump into too big an investment just yet. Plus, this place had a pre-existing fully-equipped kitchen." 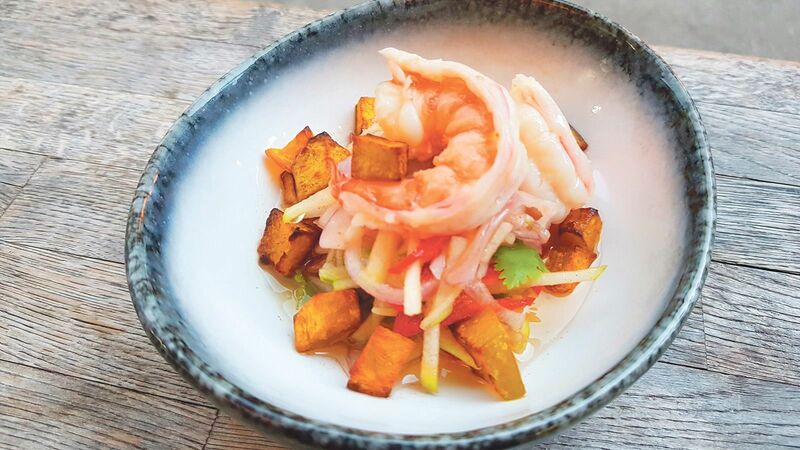 Scaled launched about two months ago with a tapas-style menu of small plates and big plates. Dishes include Fresh Crispy Squid with aioli ($12); locally-harvested XL Clams with burnt miso and butterscotch ($12); Curry Mussels with mantou or pasta ($16 or $18); and Confit Seabass with hummus, caramelised onions and a lemon dill vinaigrette ($20). It has also just added a three-course menu at $48+ and four-course menu at $58+. Prawns with Tiger's Milk, pumpkin and peanuts from Scaled by Ah Hua Kelong. Though he does not have much experience behind the stove, Mr Wong is learning on the job as he runs the kitchen with two other chefs and occasionally enlists the help of chef friends to whom he supplies seafood. "It's hard to pinpoint the kind of food we do. Basically, when people buy seafood, they just steam or fry it, but we wanted to explore and showcase other ways to cook it. What we are trying to do is prove that local seafood can be done in a simple way and still taste good because of the natural flavours," he says.